It seems like every few months, I have to rotate my earring collection, as my pairs will sneakily go missing. I’ll lose an earring backing first; then one from each pair will somehow get lost in the mess of my jewelry stand until finally I give up trying to find the missing pieces and purchase a new pair. Sound at all familiar? As anyone with pierced ears knows, keeping all your earrings together (especially the dainty ones) is pretty much impossible unless you’ve got the perfect earring storage situation figured out. In which case, please share your knowledge with me. In the interest of getting organized right before the holiday chaos ensues, we’re sharing our top tips for keeping your dresser space and jewelry collection looking as neat as possible. From simple solutions to creative DIY projects, these earring storage ideas prove that organization can look a lot like décor. Go on to see all the aesthetically pleasing ways to house your earring collection, and shop the earrings to fill them up. A glass shadow box adds an antique feel to your décor and lets you put your prettiest pieces on display. A tiered jewelry stand allows you to see everything your working with, so picking out your earrings when getting dressed is that much easier. A mirrored glass box like this makes your best items feel so special. Hang hoop and drop earrings alongside your necklaces. Even put your rings on the lower tiers. Repurposed wooden blinds make for the most creative earring storage situations. Update your jewelry box to one with a clean, modern aesthetic. Clean out a plastic egg carton to house all your tiny studs (and never lose another earring backing again!). Try out a wooden slab to give your décor a rustic, natural feel. Place all your jewels in a pretty glass bowl. Clear up space on your dresser by hanging a cool earring holder like this one make from a slab of wood and a leather string. Make a DIY wall-mounted earring and necklace display with just a few simple materials. This geometric one feel more like home décor than storage anyway. Another simple DIY earring holder takes a square piece of wood and drills in small holes just big enough for your earring posts. We love this idea because you can make as many or as few spots as you want. Instead of just plopping your earrings down right on your dresser, try a pretty jewelry tray like these marble and wood ones to display your jewelry and keep it relatively organized at the same time. Have extra scraps of leather, suede or any other thicker fabric laying around at home? Use a small cut to house your studs and smaller earrings. 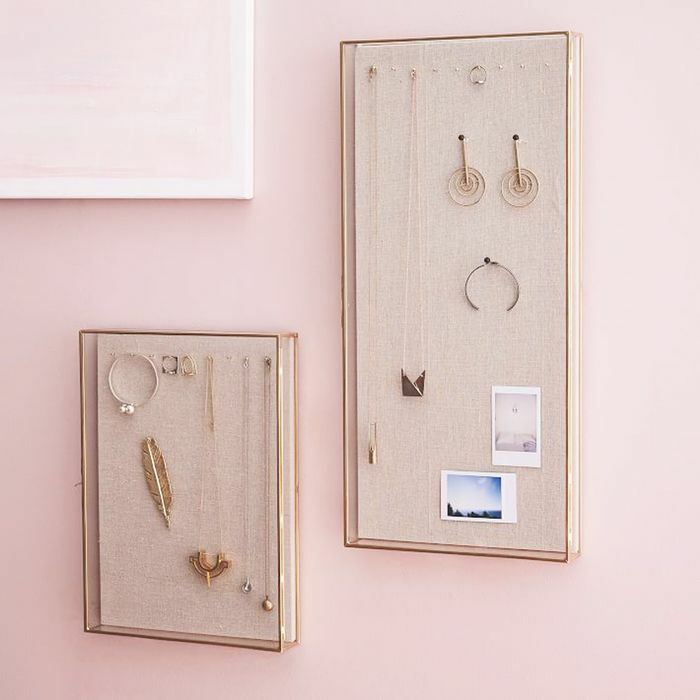 An earring organizer that stands upright allows you to see all your pretty pieces at once, making it that much simpler to pick out a pair each morning. Shop Our Pick: Alia Earring Organizer ($20). Evil eyes for good energy. Effortlessly mixing gold, diamond and wood, this stunning pair combines the brand's signature minimal design with the sculptural wood shapes of LA-based jewelry designer Sophie Monet. Be sure to mark your calendars for Black Friday when they launch a special Link Necklace that symbolizes human connection. For each necklace purchase, the founders will write a representative in the buyer's state focused on a social justice cause of the buyer's choosing. Try these when you feel like taking a break from your classic hoops. Inspired by the shape of contour line drawings, this pair toes the line between jewelry and wearable art. Not your average drop earrings. We're calling it: Rainbow jewelry will be huge in 2018. Saving these for our New Year's Eve ensemble. Wear these with rich jewel tones to illuminate their pretty stones. The two designers behind this line handcraft each pair out of their studio in Columbus, Ohio. These would look so good with a camel sweater. You'll find these drop earrings on every blogger's dresser. Jewelry inspired by contemporary art took was a major jewelry trend this year. Inspired to organize the rest of your closet? See which organization tricks the pros use.